I would like to show you how to prepare a healthy salad for very young juvenile iguanas. It is one of the most asked question I get and it is very important one. If you have a rock or green iguana that is only couple weeks old or as old as 1-2 years old, you should understand how to feed it well so it can grow to be healthy. Feeding your iguana high nutritional diet early on is very important. Below is the video that I made that shows step by step instruction on how to make an iguana salad for very young juveniles. If you feed your iguana healthy salad every day it will not become a spoiled eater. 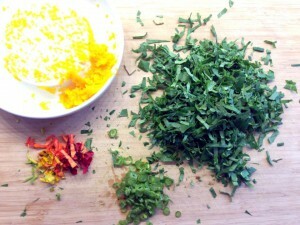 The key is to mix everything as well as possible and as small as possible so they can not pick things out. Naturally young juvenile iguanas are not picky or spoiled. I have observed that they will instinctively eat greens first. As you feed them the variety of foods they will develop preference for specific greens, vegetables and fruit. Just remember to keep the proportion of the salad well balanced, feed fresh food, feed the variety of foods and your iguana will be a great eater and grow up to be healthy. Salad Proportions: 80% greens, 20-15% vegetables, NONE-5-10% fruit all year round, plus just a sprinkle of dry alfalfa supplement. 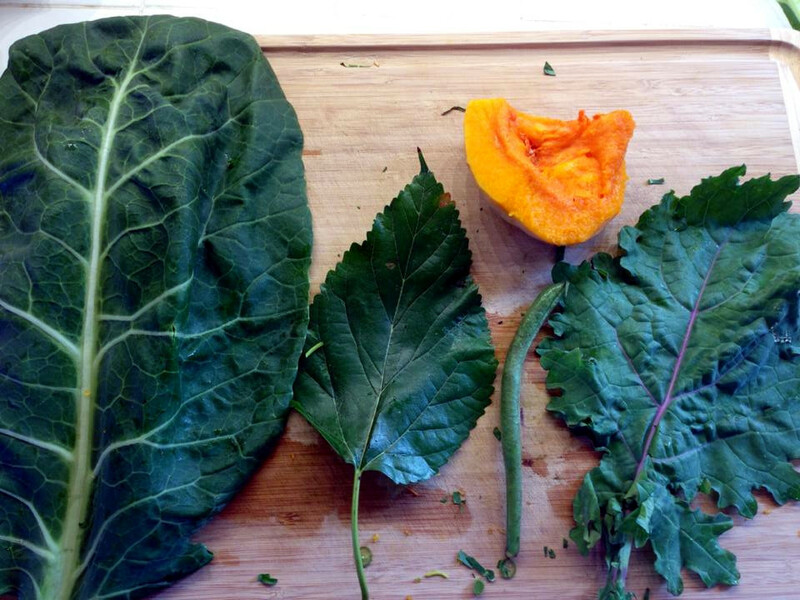 Healthy food that our juvenile iguanas love that can be given every day: collard greens, mustard greens, turnip greens, dandelions, arugula, watercress, tatsoi, bock-choy green part of the leaf, yellow butternut squash, varieties of other winter squares like kabocha, acorn. 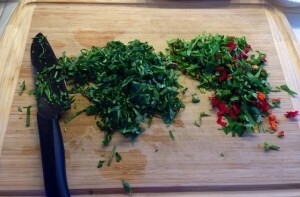 Other vegetables and greens on occasion. For fruit they love fresh figs, blueberries, papaya, mango, strawberries, guava (seedless), cactus fruit (seedless). 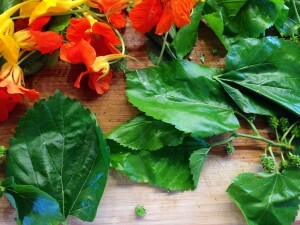 You can feed addible flowers like hibiscus, nasturtium, dandelion flowers. There are many plants that you can feed to your iguana, just take time to familiarize with the varieties and their names and nutritional value. Do your research. 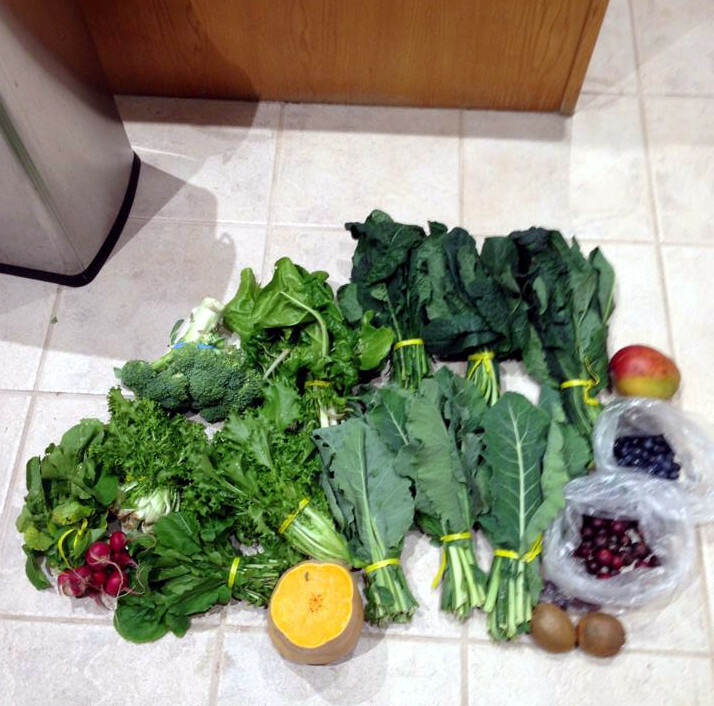 Food that I don’t feed to the juvenile iguanas: green and red cabbage, chard, spinach, beets and beet greens, peppers, too much sweet fruits like bananas. Link to Greens and Vegetable Please read fine print and do your research. Never feed a plant to your iguana that looks unfamiliar to you or if you are not sure what it is. It maybe harmful to your juvenile iguana. 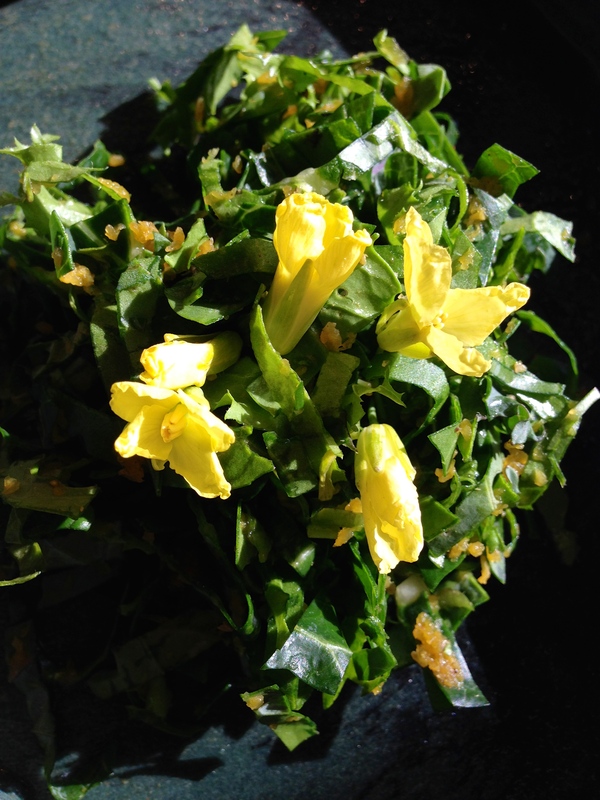 Keep in mind that no list is ever complete and the key is to offer good selection of staple (basic) greens with variety of additional greens, vegetables and fruit whatever is in season. Since we have a lot of iguanas we get out greens from the local organic farm and this is what weekly delivery looks for us. 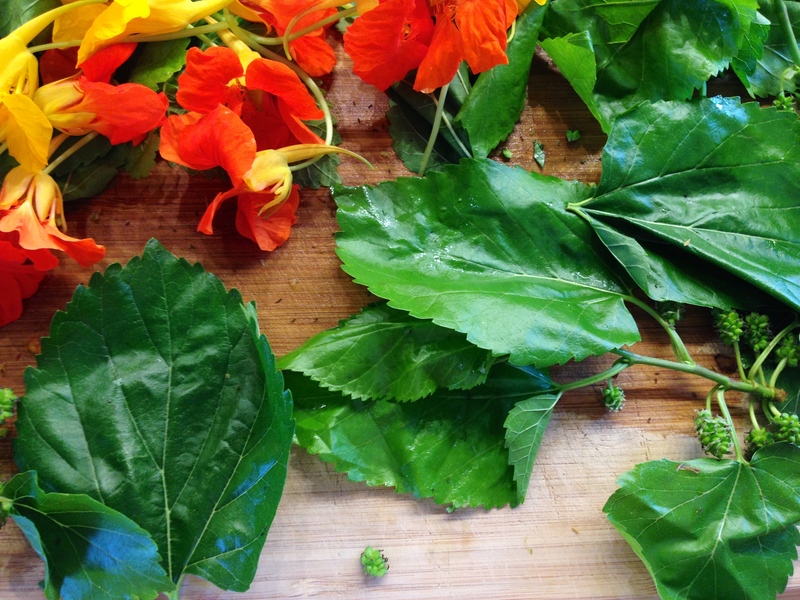 But if you have a garden you can grow a lot of the food yourself. 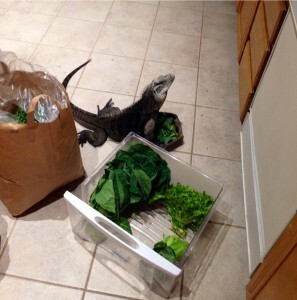 Our adult male iguana Casanova loves to hang out in the kitchen when I unpack and sort the greens. He also gets treats and snacks for “helping” me out. 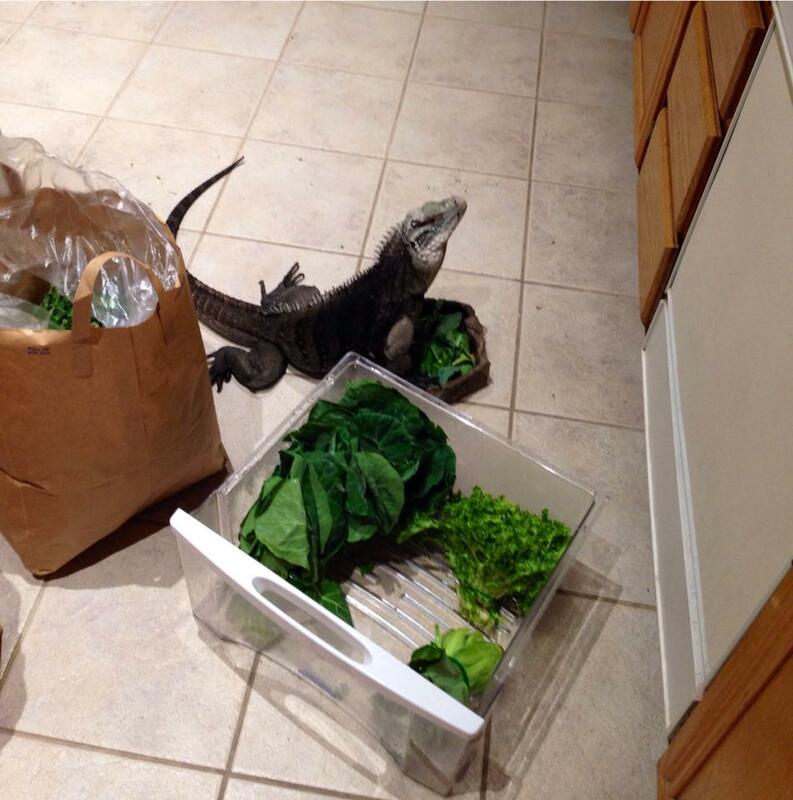 Iguana greens and Casanova, our male rock iguana “helping” me sort the greens from local organic farm delivery. 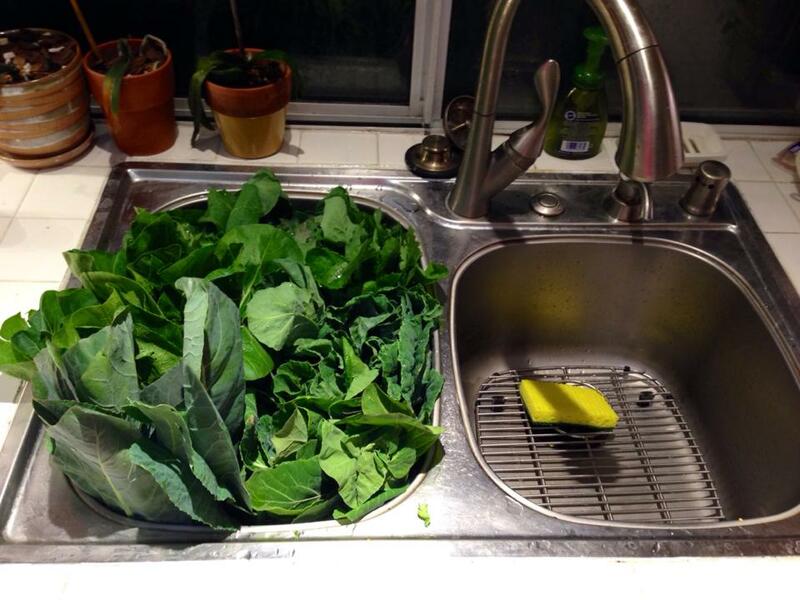 If you growing or buying greens that are organic, they usually don’t need to be washed thoroughly. Little extra soil dirt or occasional bug or aphid is not going to be a problem. But if you are shopping at the supermarket and buy non-organic greens you do need to wash them very good to rinse off all the pesticides that can be toxic for your iguana. You can also soak some greens in water to refresh them in case they got wilted during the dry hot summer days. The variety of greens can change from day to day or week to week or by season based on what’s available at the time. Here are a few examples of varieties fed at different seasons. So, after you have selected your greens for the salad you need to take the coarse and hard stems off the leaves. Juvenile rock iguanas have very tiny mouths and can not chew through hard stems. And if swallowed these stems may not be digested properly and can cause intestinal blockage and discomfort for your iguana. 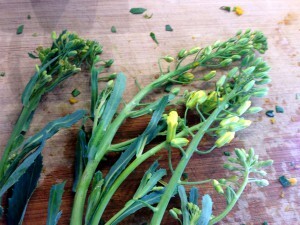 And after taking the stems off you want to chop everything in very tiny small pieces so they can be easily swallowed by your iguana. 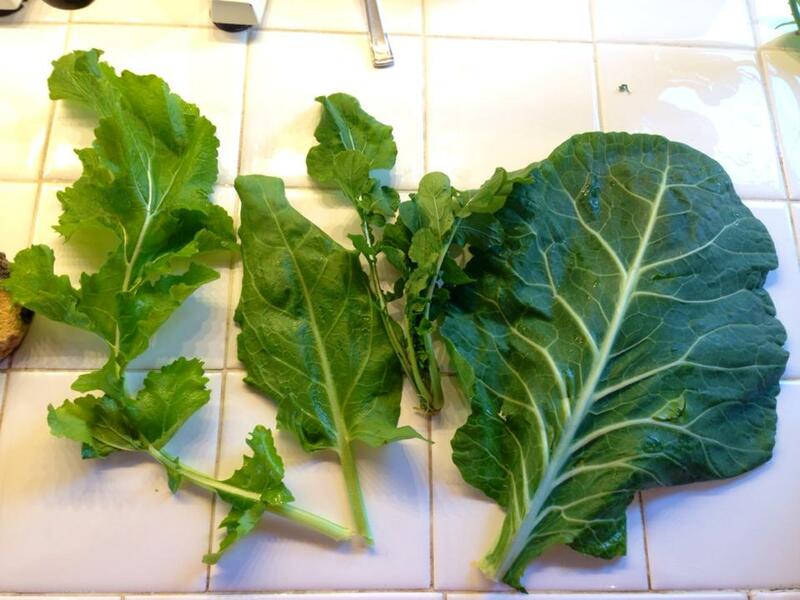 Babies that are couple weeks and month old should have their greens diced and as your iguana grows the pieces can get bigger. 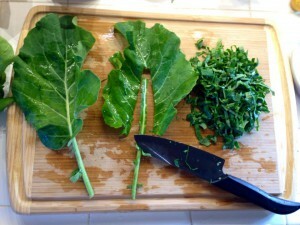 In my video above I explain this as well and show the appropriate sizes of chopped greens. 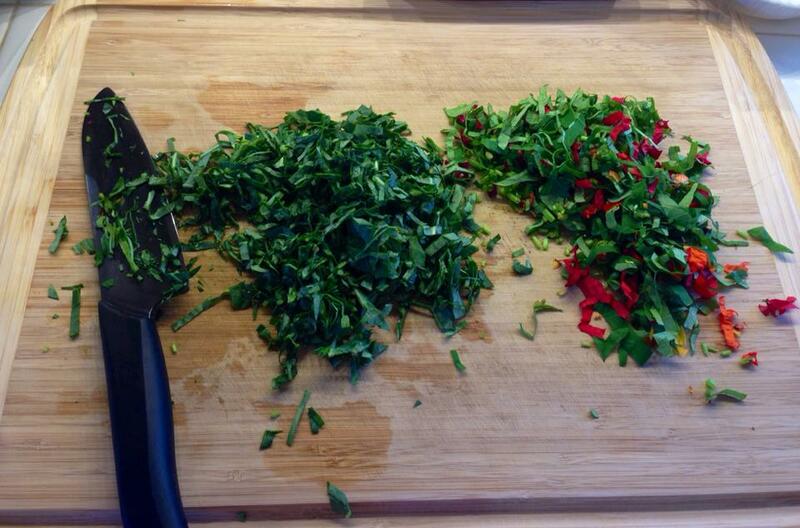 After you chopped your greens it’s time to grate your hard vegetables. First, peel your squash and take all the hard skin off. For grating I like to use a ceramic baby food grater and it work great for juvenile food since the consistency of the grated vegetables is fine and will easily get mixed with greens and eaten by your iguanas. 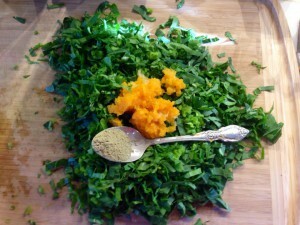 You can also use regular metal grater but on the smallest setting. 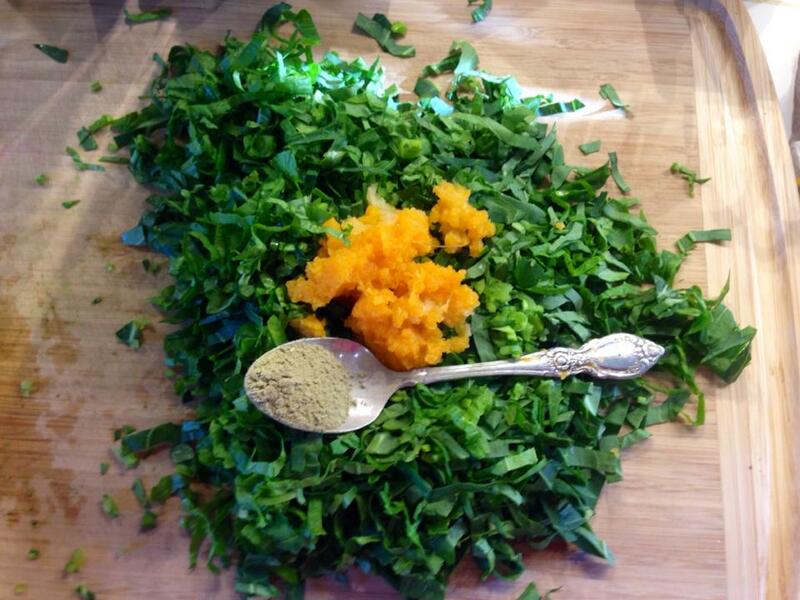 I don’t recommend using food processor for very young juveniles unless it can practically liquify hard vegetables. 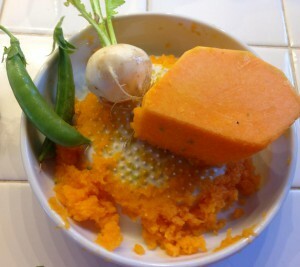 Food processors usually leave hard vegetables chopped in too big pieces for young juveniles and these pieces will not be digested properly and your iguana will feel full but not be able to extract vitamins and nutrition out these bigger pieces. Remember: smaller the pieces better your iguana will absorb nutrition from the food it eats. 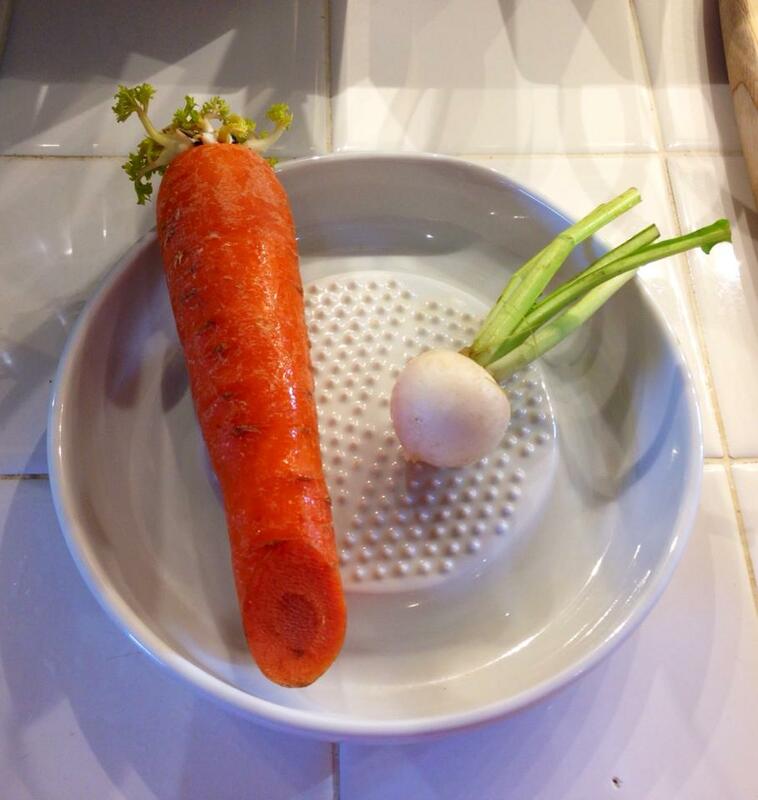 Sometimes I use carrots and turnips as vegetables in case I don’t have winter squash available. But I don’t feed carrots every day and only on special occasions as a variety. 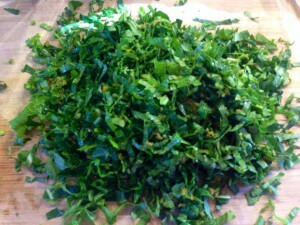 I add dry alfalfa leaf powder (organic human grade) to the salad for extra protein supplement. I buy it in bulk and feed it 4-5 times a week to juveniles and to our adult iguanas. I also have used Repashy Superveggie supplement that has mainly alfalfa powder in it with additional vegetables and vitamins. 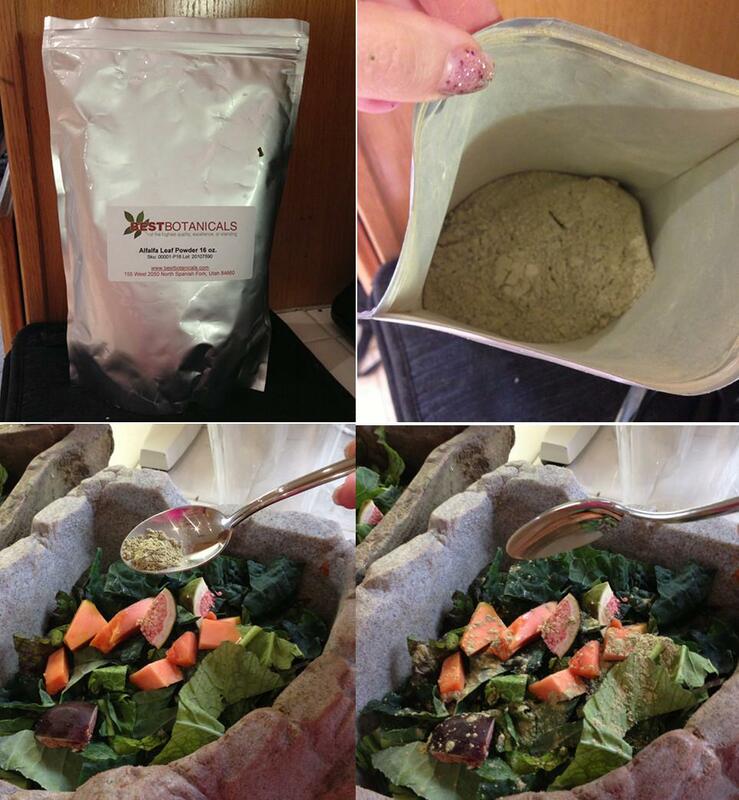 I like to mix dry alfalfa supplement with Repashy Superveggie powder 50:50 and used that as a protein supplement. If you are only feeding one or two juvenile iguanas you will need to use only tiny sprinkle of the powder on the food more like 1/8-1/10 of teaspoon. Below you can see what the alfalfa powder looks like and an example how I use this powder supplement on adult salad. 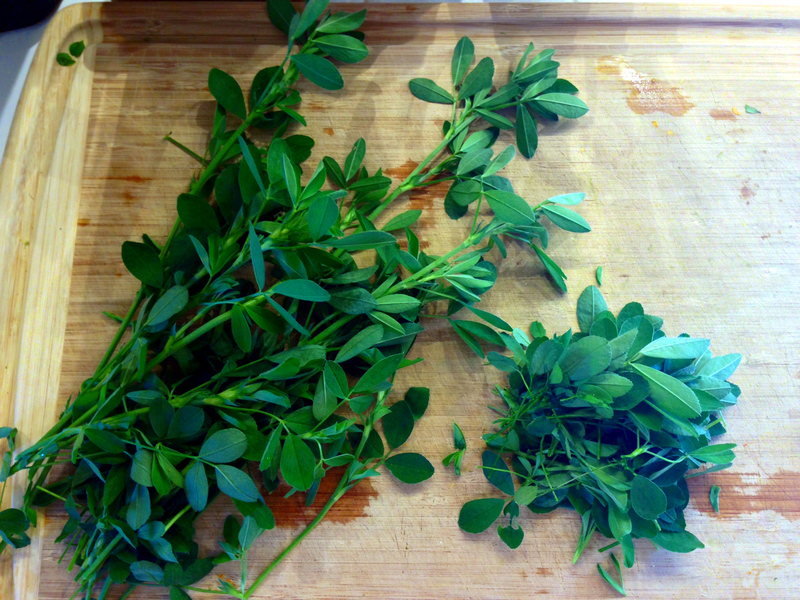 If you can grow fresh alfalfa it would be better to feed it fresh, but powder works fine if mixed with moist vegetables or on the fruit. Please don’t overuse too much dry supplement on iguana’s salad, it will not taste good to your iguana and it will not eat food. 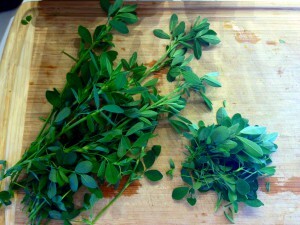 Use sparingly and with moist food. 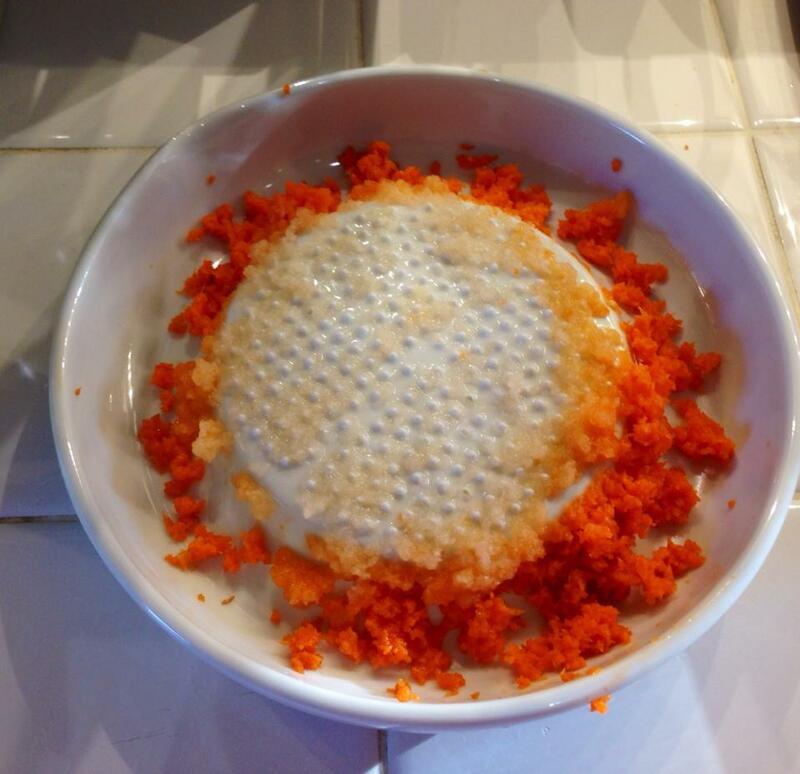 Now mix everything together very well. You can see how well greens are mixed with grated vegetables and dry alfalfa supplement. This way your iguana will eat the salad without picking out only task parts and will get best nutrition from the food. 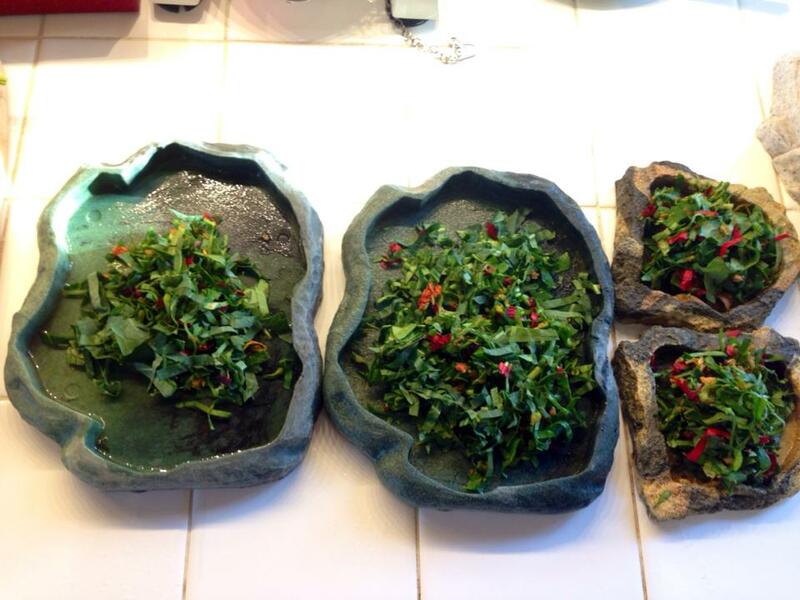 Final result: well mixed salad for juvenile iguanas is ready to serve. Red things in the food are chopped petals of hibiscus flower and nasturtium flowers. Fruit: if your iguana is eating salad very well every day you can start introducing small pieces of fruit to it’s diet. I start with only 1-2 bites of fruit once a week. And as your iguana grown, they can get 3-4 bites a day 3-4 times a week. Remember, if you give too much fruit your iguana will fill up on fruit. And since fruit is sweet and high on sugars your iguana will not feel hungry and it will start ignoring salad. If your iguana appears to be healthy and active but not eating salad, please cut out fruit out of the diet all together till it eats salad again. 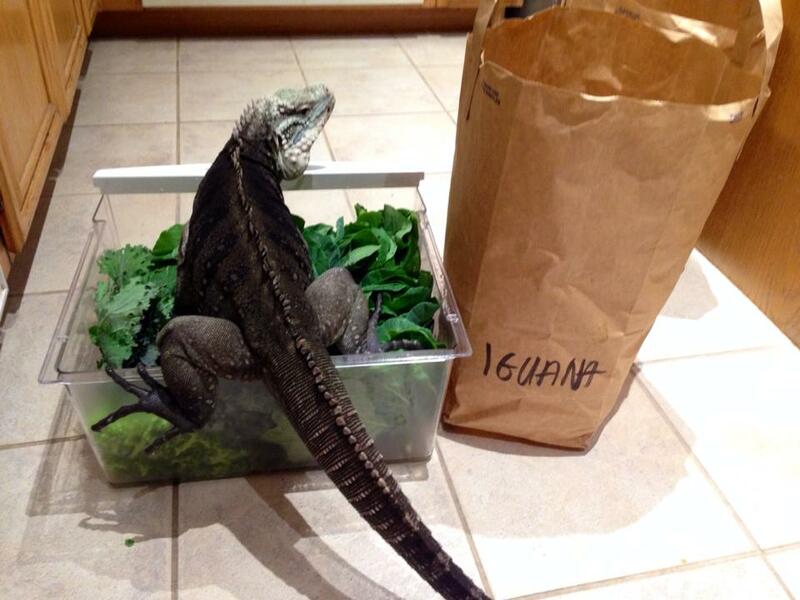 Sometimes it may take a week or so for your iguana to start eating healthy salad again. But it will eventually as it gets hungry. Few more examples of rock iguana food variety. If you can get your hands on collard plant blooms you can offer them to your iguanas. They love them. Large rock iguanas will eat the whole stems and juveniles like small yellow flowers. 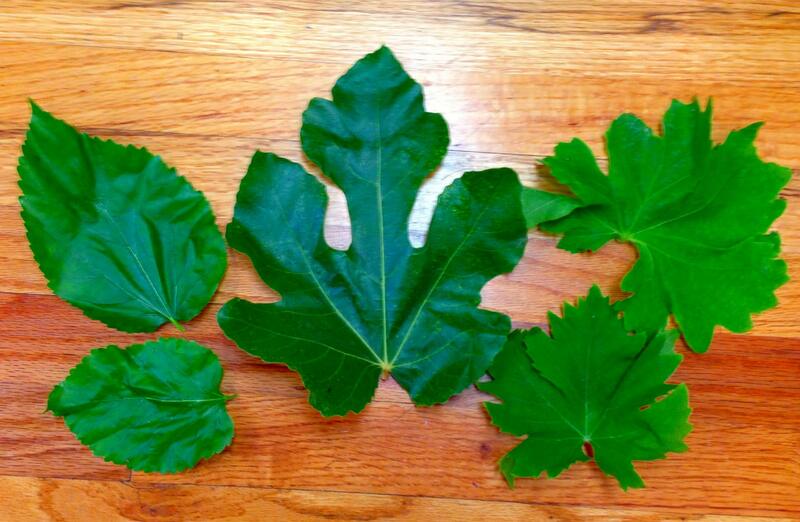 Mulberry leaves are very fresh and juicy in the spring-summer and iguanas love to eat them. Adult iguanas can eat the whole leaf at once but for your juveniles you need to take all the hard stems off the leaves first and then chop them into small pieces. 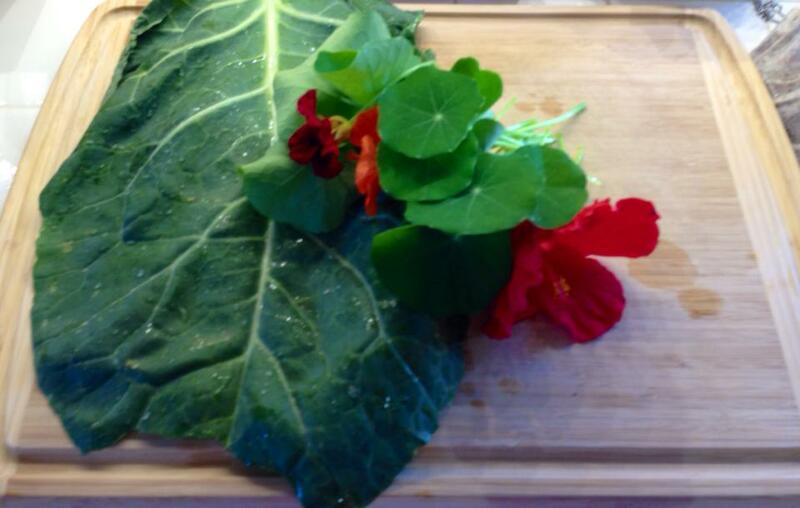 Nasturtium flowers always adds nice pop of color to the iguana salad and makes food visually exciting. You can supplement iguana salad with fresh alfalfa leaves for extra protein.